Robert Hermansen: Fool them once, shame on you. Fool them twice? In July, Robert Hermansen made up rules that didn’t actually exist in an ordinance. Today, he’s making up provisions that don’t exist in the settlement agreement. There’s a meeting on Tuesday — it’s time for him to be honest with residents. On January 31st, the Mahwah Council voted to settle the lawsuit over whether an eruv can stay in the Township. The eruv stays. 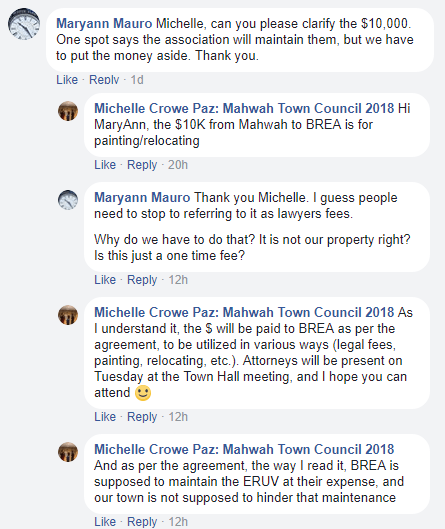 The terms of the settlement agreement are public and they can be read here: Settlement Agreement between BREA and Mahwah. Legal agreements and contracts have terms and the terms are made by lawyers to avoid issues of ambiguity. But that doesn’t stop politicians from trying to obfuscate and confuse the people they represent. Where does the agreement say that? Let’s be clear about what the agreement does and doesn’t do. It speaks to payment from Mahwah: The $10,000 payment (or additional amount negotiated in the next 20 days) relates to legal fees and costs only. It lays out what the parties understand the agreement to mean. The agreement really does lay out all the terms. Where does it say that? The word “relocation” doesn’t appear in the document. Did he make it up? Painting the poles is not a cost that was “incurred in the litigation”, therefore it doesn’t qualify. The settlement makes clear that the painting of the poles, if requested, is done solely at the expense of the BREA (see paragraph 3(c)). Had this been a random comment mistakenly uttered on the internet by people that aren’t lawyers, I might have let it go. But I wrote to Ms. Paz privately before she put in the last two comments and at the very least, she should have asked the multitude of legal talent the Township has hired before making people think the money is for something it’s not. I also wrote to Mr. Hermansen and he directed me to call the attorneys. But let’s focus on Mr. Hermansen for a moment. This episode is eerily similar to what happened with the parks ordinance. As you may recall, ordinance 1806 was very simple. It took the words “non-residents” out of the code, limiting park usage to NJ residents only. That was it, as far as the ‘letter of the law’ was concerned. Mr. Hermansen replied that an exception would be made outside of what was written in the law. I wrote about this here, in August. And now Mr. Hermansen is at it again. There is NO LANGUAGE that is IN THE AGREEMENT that speaks about a dialogue to move the eruv. It may be a conversation worth having, it might lead nowhere. I don’t have a dog in that fight and I would welcome anything that reflects a mutual agreement between the parties here. But the idea that Mr. Hermansen feels so free to casually disregard what laws and agreements actually say, when it suits him, makes him a very poor choice for representing the best interests of anyone. Beware Mahwah residents, you have been warned. Some conditions apply, see agreement for full list of requirements. In settlement papers filed with the court today, Mahwah has given up on their six month campaign aimed at “keeping the poles clean” and upholding their “way of life”. In a vote of 5-2, the Mahwah Council agreed to settle claims brought by the Bergen Rockland Eruv Association against the Township for threatening to issue summonses over an eruv erected in a section of the municipality. Pursuant to the agreement, the Township will put $10,000 in an account to cover some legal costs*. The Eruv Association will change the color of the pvc piping in the poles (called lechis) over the next 12 months. The parties will also have 20 days to agree to a sum above and beyond the $10,000. Sources tell Eruv Litigation that this was the change requested by Council President Robert Hermansen. It is not immediately clear why an additional amount would be provided. Each party will bear their own litigation costs which may have been at least $311,000 as of today pursuant to the agreement Mahwah signed. Plaintiffs agree not to file any further charges with any local, state or federal agency against the Township and/or any of its employees, agents or administrators arising from dealings that have occurred up to and through the date of execution by all Parties to this Agreement. The Township consents to the existence, restoration, maintenance, repair and upkeep of the lechis comprising the Eruv. Nothing in the agreement prohibits the eruv from a future expansion and / or modification within and / or outside the Township (the plaintiffs will however confer with the town if any expansion is planned). The Township of Mahwah won’t stop the Plaintiffs from restoring, repairing, keeping or maintaining the eruv. Nor will they seek to enforce or adopt any ordinance or resolution prohibiting or impeding future lechis on poles. Mahwah can request for the BREA to change the color and / or replace the lechis to better match the poles, within the next 12 months (unless the utility says they can only be a certain color). No public funds will go towards the Eruv. If the Township violates the agreement, the plaintiffs may seek an expedited and immediate injunctive relief through an order from the court. Plaintiffs will not initiate any new litigation against Mahwah for at least 2 years as long as they abide by the agreement. Neither party shall be considered a “prevailing party” and there is no admission of liability.